For those of us who live in northern climes, the annual struggle with snowfall is real. While the white stuff is beautiful, it also makes driving and walking difficult – including on our own residential and business properties. As kids, that may have provided a way to make a few bucks off the neighbors. But as we grow older and busier, it’s more of a hassle and even a health hazard. But heated driveways and sidewalks are a great way to help overcome these troubles and get your walking and driving surfaces snow- and ice-free. Let’s have a look at some of the benefits of heated driveways and the basic types that are available to help you keep your surfaces clear. Shoveling snow takes enormous amounts of time and energy. But it’s absolutely necessary. You might not even be able to get your car on the road without first digging out. Often, that’s not time or energy you have, especially if you have a larger home with a long driveway. By the time the snow stops, you’ll have limited time to get to work or wherever else you need to go. And if you own a business, you have to repeat the same process when you arrive there. Not only that, but shoveling snow expends so much energy that it can also be a health hazard. Even though it looks so soft and light coming down, it weighs a lot, as anyone who has shoveled can understand. Doing all that lifting can lead to muscle strain and much worse. Every year in the United States, around 100 people die while shoveling snow. Of course, that’s more common in older adults but it can affect anyone. We already mentioned the hazards that can come from shoveling, but slips and falls are another big risk for any passersby. Of course, out of a basic sense of humanity, you don’t want anyone to get hurt. But it’s also a legal liability if you fail to properly clear your public sidewalks or if they ice over again later. Many municipalities even aggressively issue fines if the walkway isn’t clear within an appropriate period after a winter storm. A heated system to melt the snow and ice – especially an automatic one – helps keep you and others safe by removing the ice and snow in a timely manner. And that, in turn, helps keep you safe from legal responsibility. Ok, not every type of system is automatic. However, the best systems are. That means that if you are out of town or just simply forget to start the system, it still runs. With the rise of the Internet of Things, it’s likely that even more control will soon be available based on your input from your phone as well weather reports pulled from the web. As you might suspect, adding a heated driveway and walkway system is a significant investment, both for installation and for use. However, over time it does pay for itself. These saving come about through a number of factors. First, you’d be paying for snow removal otherwise. That may not seem like much at first, but it does add up over time. Second, that snow removal, even while it provides one benefit, could also be damaging your surfaces. Plows can chip and disfigure the concrete. Some of the chemicals used for ice melt can also eat away at the material. Finally, there is the unknown factor of what would have happened if your drive or sidewalk wasn’t cleared. Would you be paying a hospital to treat your back when you threw it out shoveling? Or maybe for someone’s broken leg when they slipped and fell? These heated systems help avoid those problems. Heated driveway systems are energy-efficient and actually help your stamped concrete or any other surface to last longer. There are basically two types of heated driveway system: electrical and heated water. They both work on the principals of radiated heat, much the same way radiators or electric baseboard heating works in your home. Like a radiator, these systems rely on a boiler that will heat the water that circulates in pipes installed under the driveway. The heat in turn passes through the ground and warms the surface, melting the ice and snow. 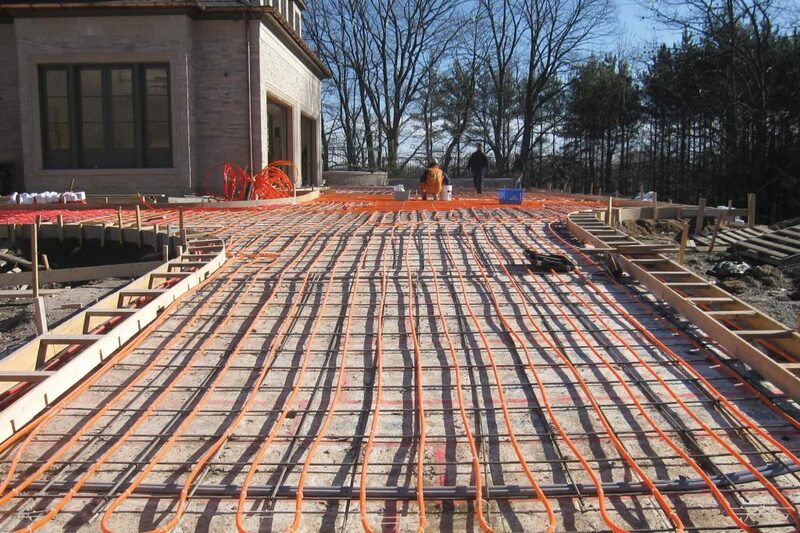 Instead of using water, these systems use wires under the driveway. Electric current heats the wires which in turn heat the ground. The cost of installation can be higher for heated water systems but it can vary widely depending on whether you already have a boiler that can support the system. Of course it will be more expensive if you need a new boiler installed. In the long run, the cost of running a heated-water system tends to be lower than electric. Another option – available for both types of systems – is automatic operation. With most automatic systems, the system primes itself when the temperature goes down to just above freezing. That allows it to ramp up more slowly instead of trying to heat up suddenly. This preheating also allows the snow to melt more quickly since the ground is already somewhat warm when snow falls. In cases where the system only comes on after the snow is on the ground, the bottom layer of snow can melt but this can form an insulated pocket of air. That, in turn, actually makes the melting process slower. Of course the main benefit of an automatic system is that you don’t have to worry about forgetting to start it up or even be present to do so. A manual system can work, but you have to remember to turn it on. If it slips your mind or you happen to be away, you’ll face slower melting or even lose out on the benefits altogether. So automatic systems are definitely the way to go. Heated sidewalks, walkways,and driveways can save you a lot of frustrating and time-consuming work to clear your surfaces of snow and ice. They are a great investment that will help prolong the life of your surface and protect you from issues related to slips and falls. If you’re interested in learning more about heated driveways, get in touch with us today!